Where was surfing invented? How did Hawaiians modify the ʻuma (chest) boards? Why is heʻe nalu good for the whole body? What is the connection between surfing and nature? Of all the people you know, who is the most avid surfer? In what ways does heʻe nalu strengthen your friendships and bring your ʻohana together? What are some different kinds of surfboards and surfing styles? Do you need a surfboard to surf waves? Do you think heʻe nalu should be an Olympic sport? Why or why not? If you had only traditional materials, like wood and old-style dyes, what kind of surfboards would you design? Would the shape be different from today’s styles? Put some of your ideas down on paper. Heʻe ana i ka lala, hoʻi ana i ka muku. Sliding across the face of a wave, returning to the curl. Two basic surfing maneuvers often mentioned in mele and moʻolelo on surfing. If you like surfing, it’s hard to beat Hawaiʻi! Whether you’re an avid surfer or just getting interested, there’s a lot to learn about heʻe nalu, a sport that truly was made in Hawaiʻi. Heʻe nalu is part of famous Hawaiian legends. For example, what’s the first thing Lohiʻau wanted to do after Hiʻiaka brought him back to life? Surf, of course! There were just two problems: (1) no waves, and (2) no surfboard. Lucky for Lohiʻau there was a goddess nearby, which meant big waves started rolling in. For a surfboard, he used Hiʻiaka’s magical skirt of palaʻā ferns. Not all of us get to surf on palaʻā ferns. Still, we can be thankful that heʻe nalu was passed down to us by our Hawaiian kūpuna. Surfing is a big thing. It’s practiced around the world. Entire books have been written about this invention, like John Clark’s Hawaiian Surfing: Traditions from the Past. Back in the day, surfing was a national pastime. Everyone did it—men, women, young people, old people, aliʻi, and makaʻāinana. Surfing requires skill, strength, and stamina. Especially in the old days, when surfers would swim (instead of paddle) their boards out to the break! Surfers have to know their environment—the break, the reef, the tides, the moon phase, the winds, and the weather. All of these affect the surf session. Instead of buying a board at T&C Surf, our kūpuna went to their nearby forest. There they would select the right tree—not too old, not too soft, but just right. The best ones were koa, wiliwili, kukui, ʻohe, and others. After cutting down the tree and making offerings of prayer and kūmū fish, our kūpuna would start shaping the wood. The more they cut off, the less they had to carry down the mountain. So they got their board as close to the desired size as possible. Then they would pull the board down to the beach, where the carving would be completed. The surfboard would be stained black with plant material. Then it would be wrapped tightly in kapa and left in an appropriate place until it was time to go surf. Just as there are well-known surfboard shapers today, there were experts in surfboard carving in the old days. Craftsmen called kahuna kālai papa alaia heʻe nalu specialized in shaping a specific type of surfboard—the alaia. Alaia are small, thin boards of ʻulu or koa. Another type of traditional surfboard is the olo. It is a long board often made of wiliwili. Olo boards were usually owned by the aliʻi. What do rivers, waves, and backwash have in common? They can all be surfed! As trendy as surfing is, it truly is a thing of the past. Our Hawaiian kūpuna invented it, along with river surfing, outrigger canoe surfing, bodysurfing, bodyboarding, and sand sliding. If something could be surfed, our kūpuna were on it. Some fun, creative people, our kūpuna! Heʻe nalu: board surfing. Our kūpuna would ride their boards lying on their stomachs, sitting, kneeling, standing, or with one knee up and the other one down. Heʻe puʻe wai: river surfing. Flash-flooding rivers would create a stationary wave, like the Flowrider ride at Hawaiian Waters Adventure Park. Rides can last a couple minutes, and there’s no paddling to the surf break! Pākā waʻa: outrigger canoe surfing. If you’ve ever surfed at Canoes in Waikīkī, you’ve seen this sport in action. It takes an experienced steersman to catch the right wave at the right point, and to avoid hitting people in the canoe’s wide path. Pae poʻo: bodyboarding. Traditionally called “papa liʻiliʻi” (small boards), bodyboards were later called “pae poʻo” (to ride a wave head first, like bodysurfing but with a board). Heʻe one: sand sliding. 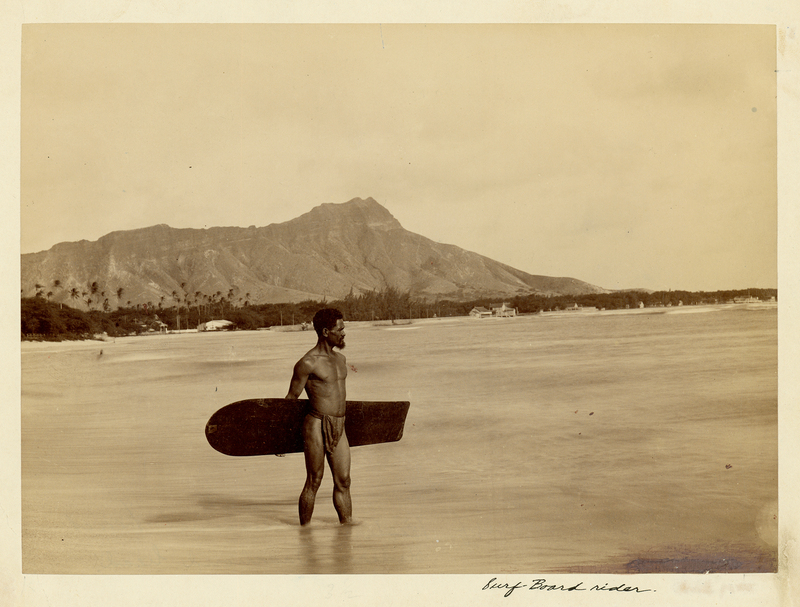 Traditionally heʻe one involved a surfer running and sliding onto the backwash on shore with his chest. Surf contests today focus a lot on the maneuvers a surfer does on a wave. If your moves are innovative, varied, and numerous, you’ll get a higher score. And it’s usually one person per wave. Traditional surf contests actually involved surfers catching the same wave. They would ride the wave as far as they could toward the shore. The first to pass a calabash buoy was the winner. The sun’s up. The day is calm. You don’t have school or work. The only thing missing is surf . . . and maybe Hiʻiaka’s number on speed dial. Well, that didn’t stop our kūpuna. They have surf chants to bring up the waves. 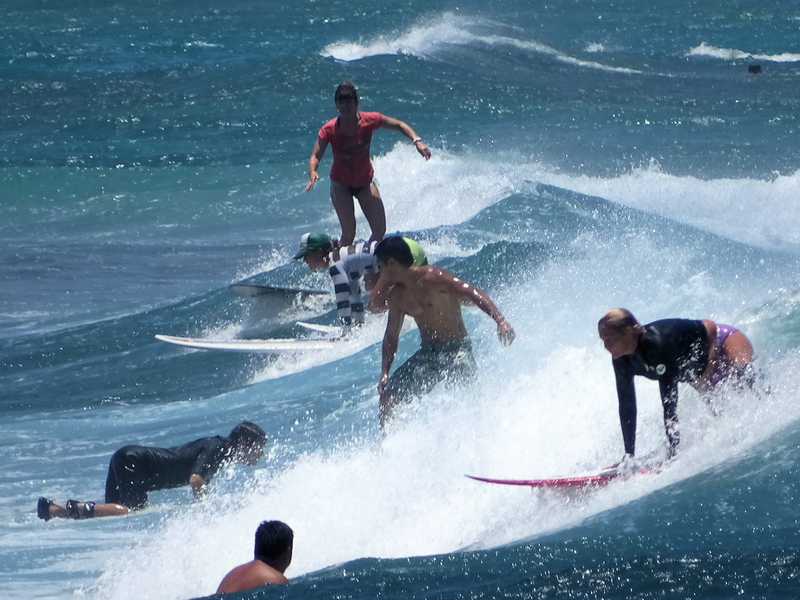 Just as there are heiau for agriculture, healing, and fishing, there are heiau for surfing. 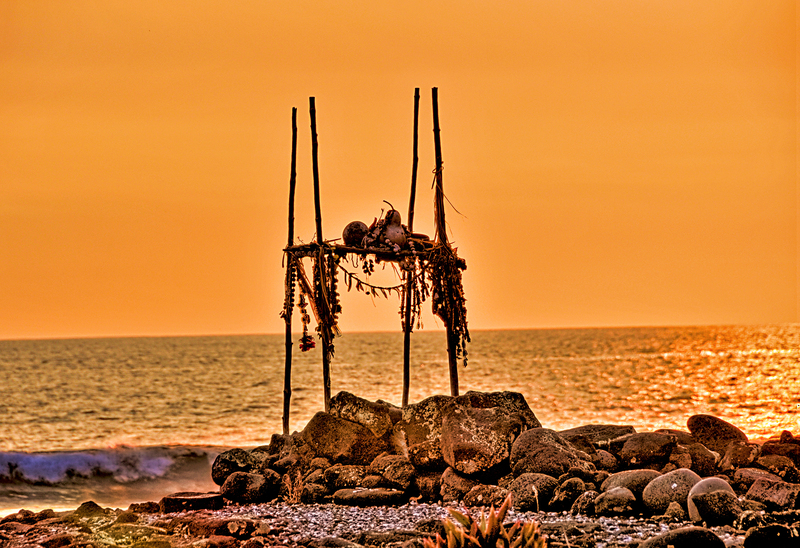 Kuʻemanu heiau in Kona, Hawaiʻi, was a place to make offerings for good surf conditions and good sport. It also provided a good view for watching surfers and a pool to rinse off the salt after a surf session. Someone in the lineup calling you a kaʻupu bird? Take that as a compliment. Our kūpuna likened the graceful gliding of seabirds over the ocean to the smooth, skillful glide of surfers on waves. Besides being seabird-like, another sign of a good surfer was that he didn’t get wet in the waves—lalilali ʻole. That probably meant that he never fell off his board. To ride a wave from the break all the way to shore—and actually land on the sand, “pae i ke one”—was another display of a surfer’s prowess. Need an excuse to go surfing? Can’t convince your teacher that the big surf at Haleʻiwa is more important than the upcoming exam? Well, the teacher probably has a valid point. But if you could take cues from Pāpā Malaki Kanahele of Niʻihau, he would tell you about the time he went surfing instead of doing his chores … and he didn’t get in trouble! So by surfing, you are helping to perpetuate the traditions of our kūpuna. While that may not always work as an excuse not to do something you’re supposed to, it is a good reason to surf when you’re able. While you’ll find surf spots on all of the eight main Hawaiian Islands—yes, even Kahoʻolawe—Oʻahu has the most. 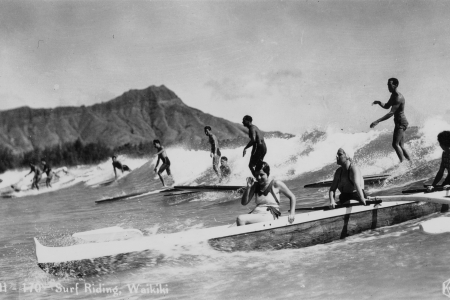 And if you learned to surf on Oʻahu, you may have had your start at Waikīkī. 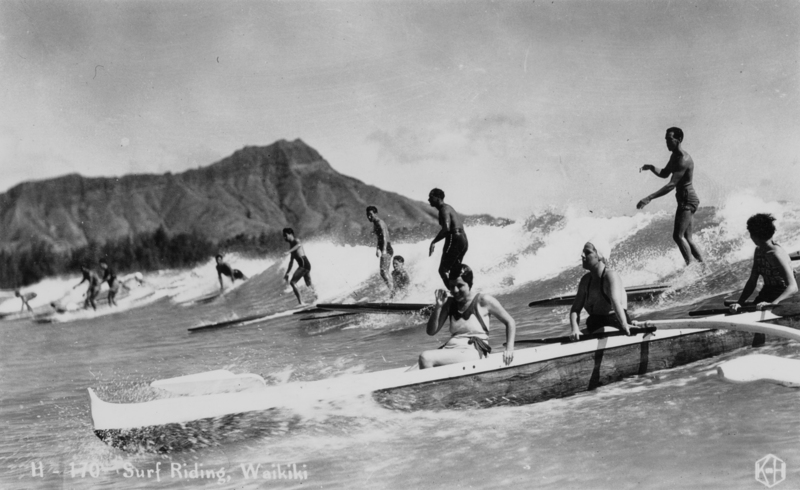 Several of Waikīkī’s main surf spots from long ago are still popular today, including Kalehuawehe (often referred to as Castle’s), ʻAiwohi (Publics), Maihiwa (Cunha’s), and Kapuni (Canoes) (Clark 2011). 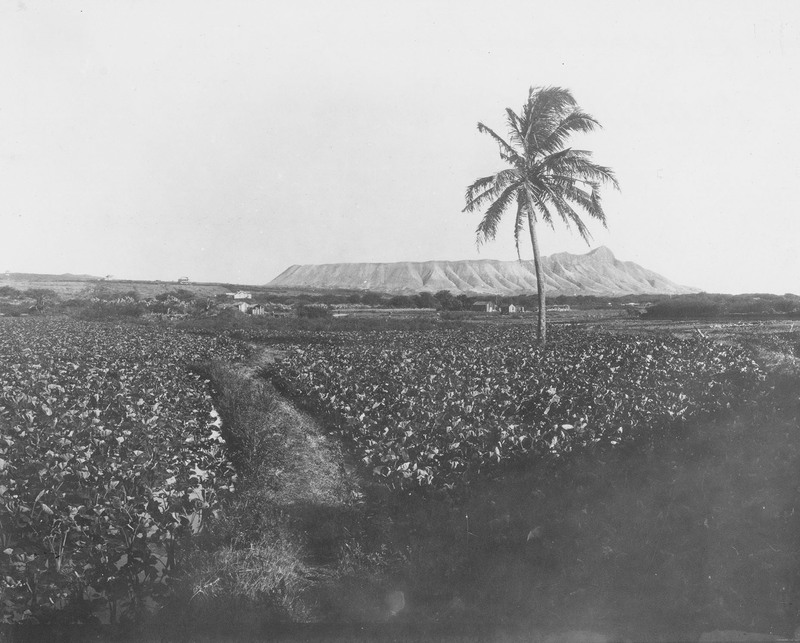 Kalehuawehe was named for the lei of lehua that Pīkoiakaʻalalā, a famous arrow shooter, removed from his head and gave to the chiefess Kahamaluʻihi. The two had been out surfing and had floated to the spot, which was previously unnamed. There, Kahamaluʻihi asked Pīkoiakaʻalalā for his lei lehua, and he assented, tying the lei around her neck. But the Waikīkī that Pīkoiakaʻalalā knew is much different from the place we know today. 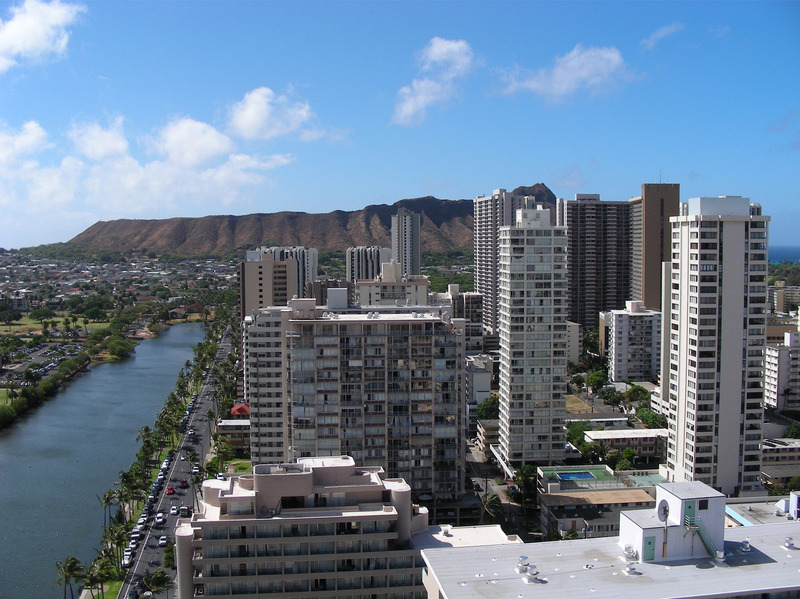 There used to be kalo fields and fishponds where today’s hotels and condominiums stand. Sadly, the once-healthy reef and abundant limu are being choked out by pollution and runoff. For all that has changed and even been destroyed in Waikīkī, surfing is still common and is here to stay. Surfing, like our people, is constantly evolving. New technology has resulted in lighter, faster, more maneuverable boards. The maneuvers surfers pull off today would probably get our kūpuna kahiko pretty stoked. 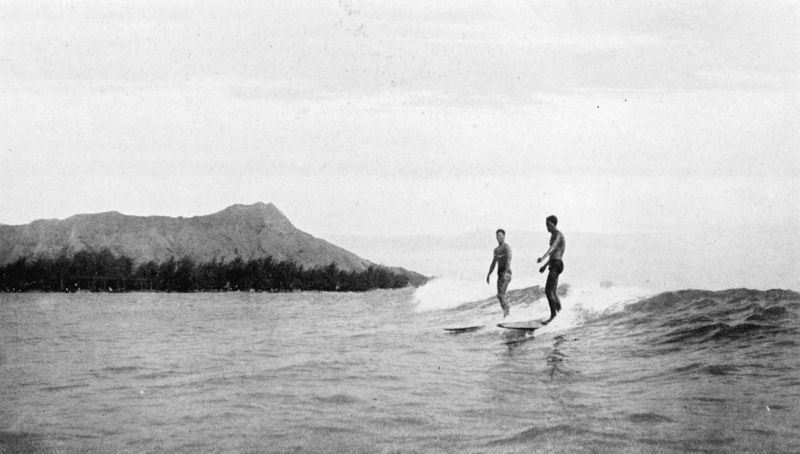 The Hawaiian surf spots we know of today are probably the same ones our kūpuna surfed. The names given to those spots have meaning, and they are still relevant. 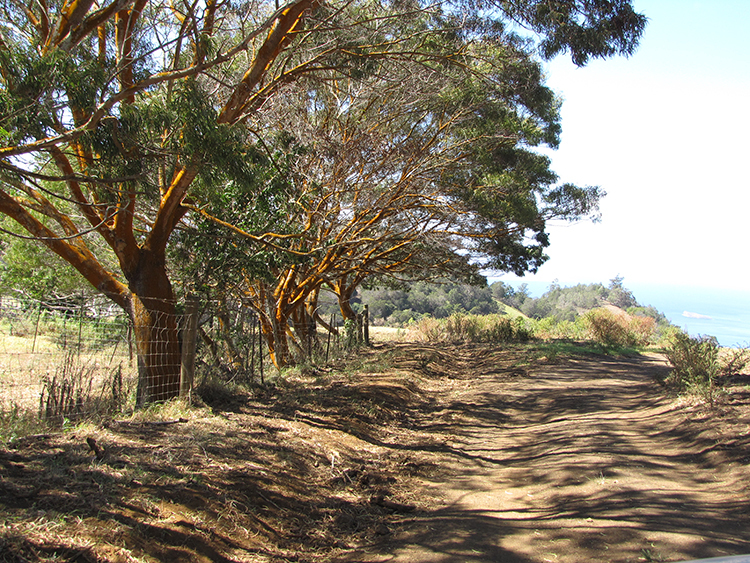 By using those names and continuing the traditional practices of our kūpuna, we honor them, ourselves, and our future. And by caring for the land and the sea, the way our kūpuna did before us, we ensure a healthy environment for us and for the next generations. There is still a lot we can learn from our kūpuna, the inventers of cool. E kū, e hume a paʻa i ka malo Stand, gird fast the loincloth! Kai heʻe nalu i ke awakea At high noontime this is the surf to ride! ʻIkea ka nalu nui o Puna, o Hilo! Now you have seen great surfs at Puna and Hilo!